driving force is applied across the membrane. module design, capital and operating costs continue to decline. nanofiltration (NF), Electrodialysis(ED or EDR), and reverse osmosis (RO). rapidly as plant size decreases. a feed pump, a cleaning pump, the membrane modules, and some holding tanks. greater frequency in small systems as the complexity of conventional treatment processes for small systems increases. cost impacts from problems are potentially high. dimensions, is a specification used by membrane suppliers to describe a membrane’s retention capabilities. former method of sand filtration. Regular cleansing on the membranes is essential. • Efficiency of energy by filtrating the whole supply water which requires small capacity of pumps. • If cleansing is not done properly in time, recovery is usually incapable. • Retaining high flux filtration is possible due to the suppression of accumulation of colloids. • Hhigh flux filtration requires bigger pumps which sometime result in inefficiency. amount of pump or flow meters to retain a certain amount of water. ▶ Main considerations when designing the facility are transmittal Flux, temperature, operation pressure, and retrieval rate. 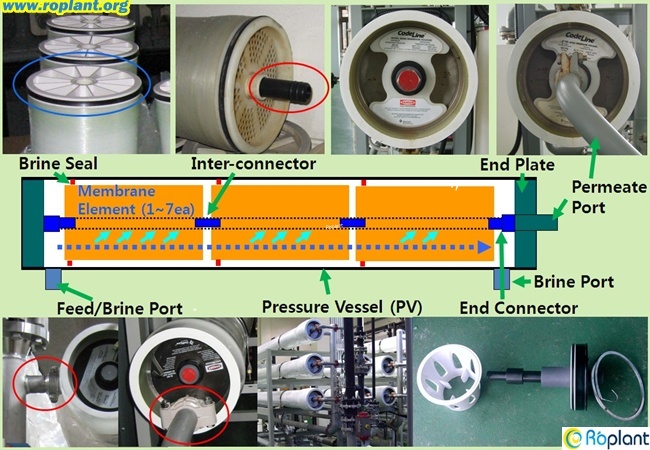 As it is closely related to the efficiency and functions of membranes, significant amount of examination is needed. is the standard; when operating static flux control system, membrane pressure on the lowest temperature is the standard. sufficient consideration about temperatures and production capability at the lowest degree is required. gets smaller while designing for the process. • Recovery rate estimates the transmittal flux to supply water amount. It shows the sufficiency of dealing with filtration. Silt Density Index(SDI) or Fouling-Index (FI). ▶ Silt is composed by suspended particulates of all types that accumulate on the membrane surface. Sources of silt are organic colloids, iron corrosion products,precipitated iron hydroxide, algae, and fine particular matter. in water purification systems, especially using reverse osmosis (RO) or Nanofiltration membranes. of < 1 NTU. Correspondingly the membranes show very low fouling at a feed SDI of less than 5.
normally 15 minutes (after silt-built up) represents the SDI value. 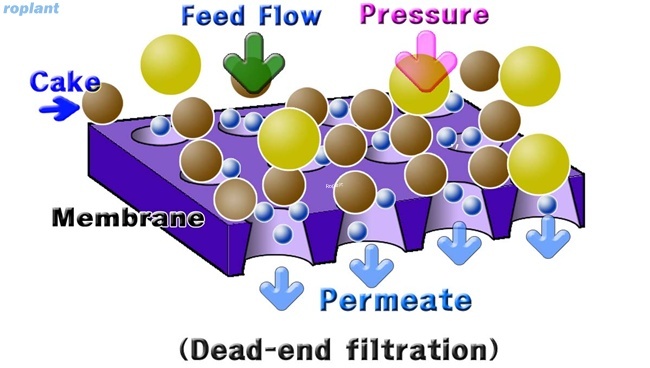 ▶ Contamination of membranes make the resistance of filtration increased, decreasing the transmission of Flux. Its main reason is the thickness of density caused by formation of cake on the surface of membranes. treatments that varies to the elements in the water. amount of water in low pressure. • It is favorable to use electrically treated water supplied by RO filtration for cleansing. 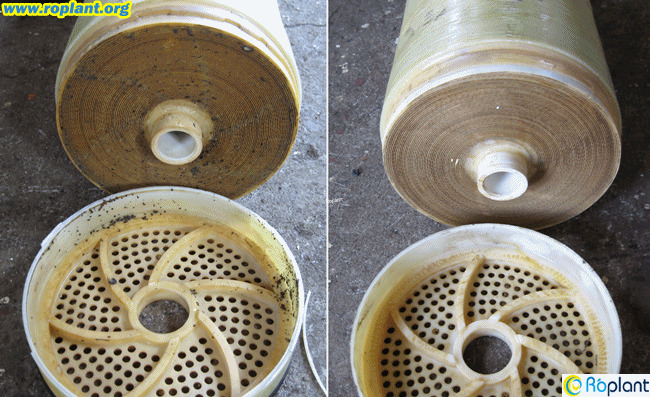 • CIP(Clean in Place) is used when recovering the filtration capability with mechanical cleansing is insufficient. • It suspends the membrane filtration operation and removes the contaminants with chemicals. • It also sterilizes the whole facility when necessary. • Chemical cleansing is implemented by the following process with acid, or alkali cleansing.